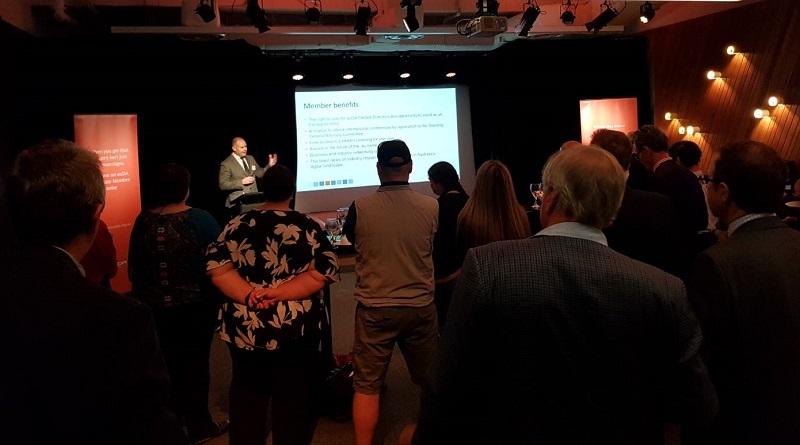 Today’s blog post provides a recap of the .au Domain Administration (auDA) Associate Membership Launch held last night at ACMI, Melbourne. Three representatives from Afilias Australia attended the event including Patrick Donaldson - Country Manager, Gaby Facci - Tech Support Team Lead and myself, Greta Adamo - Marketing Coordinator. As explained on our website, Afilias Australia was chosen by auDA to provide registry services for Australia’s .au country code top level domain (ccTLD) as of July 1st 2018, and we continue to work closely together in developing the .au namespace. While auDA have offered a membership model since their beginnings in 2001, it has recently been redesigned under the new auDA constitution with the development of a new website, joinauda.org.au, where prospective members can sign up on the spot. The evening began with a room full of industry professionals mingling while enjoying drinks and canapes, excited to be on the receiving end of an open invitation to be involved in the future of .au. Cameron Boardman, CEO of auDA kicked things off with a warm welcome to everyone in the room and to those who joined via webinar. Mr Boardman acknowledged that .au is a vital part of the digital economy, and encouraged everybody to join so that the membership could be as wide and diverse as possible. Experienced advertising executive, political commentator and campaigner and panelist on ABC’s Gruen, Dee Madigan gave a keynote presentation on ‘Why Creativity Matters’. Those who are familiar with Dee, will appreciate her direct, informative approach. Key messages she focused on included developing a strong brand presence and reasons why organisations need to get both customers and employees on board. Dee closed her presentation by looking at how a domain name can strengthen your brand in ways that social media cannot. Key takeaways included the heightened level of branding and authority derived from a URL, the ability to control your websites contents, remarket to your audience and get more conversions. Hearing from experts within the industry emphasised the importance of ensuring that the .au namespace remains as inclusive and transparent as possible. Looking around the room, it was clear that this event was a reminder to us all that auDA needs as much support as they can get to ensure that organisations, not-for-profits and individuals continue to have a strong .au presence. If you are interested in becoming a member, check out auDA’s new website, launched this week, joinauda.org.au.